Maul(L), EP, Boba, DN and STHan where an early match execute on Chirrut left him with a sliver of health and it came down to Maul vs Chirrut and DN. With all of the cleaners, I would have to land Daze and then either Stun or Ability block Rex, Chirrut and GK to get the advantage needed to win the match. For each of my attempts, Daze failed to land on at least 1 of those 3, resulting in the cleanse. B2 would normally be a good option against double taunt, but that still depends on landing Daze + Stun/AB first or the AoE will feed too much TM. Also, for Boba to be of any use against Chirrut it's usually counter productive to dispel his HoTs. I don't have Sith Assassin ready yet, but maybe DN lead with her to boost turn 1 TM would be an option. Your first and foremost target should be chirrut. If you can't OH him then try to get as much buffs on him as you can in the first rounds of the battle. To do so, take down his prot as much as possible with thethe strongest attack, this should trigger gk, put any debuff on gk and watch allthe the cleanses with additional buffs coming up. Reattach crit immunity with aoe. If you managed to get him under 100% there should already be hots on him with a total of 4-5 buffs. This should be enough for boba. Try this at the beginning. Many tries might be necessary. After that you can just auto the rest of the battle. Oh and you might want to check out sith trooper. More viable with all the zmaul love. He's a badass even on those 3*. Its a tough team. Its all built around keeping nihilus alive to do his work. I have found that zQGJ jedi with zoda (+ jka kenobi barris but mix and match what works for you) well becaue the constant foresight seems to slow nihilus and he cant get to his ultimate move quickly. One of the whales on my shard runs it and for me the most painful part is kenobis recurring taunt. For this reason I generally just focus kenobi down 1st using tmr from qgj and yoda to keep slowing nihilus down. When kenobi is finally down i can focus on nihilus totally and use zoda to finish the taunts on Baze ie battle meditation forces baze to 100% tm and ends his taunt. Then back to nihilus. It's RNG and speed dependent but Zader B2 Nihilus EP STH worked pretty well last time I fought that team in GW. Need to make sure that their Nihilus uses his CD skill as little as possible. Jetlife, your team doesn't match up with the turn of events. How are you debuffing Baze on your first two moves with 1 debuffer? Also, if you're killing GK first, why bother debuffing Baze only to focus on another tank? Maul goes first and lands Daze on at least all 3 cleansers. EP immediately follows up with a stun on hopefully all 3 cleansers, DN follows that up with cooldown reduction. Chirrut seems to be the hardest to stun reliably and will go next with a basic attack due to DN blocking his cleanse. Boba targets Chirrut and hopefully lands 2-turn ability block. That's how the opener has to play out, and if I fail to land both Stun & Ability Block on just 1 of the 3 cleansers I lose. If the opener is successful, the rest of the battle is very straight forward. EP adds offense up, Vader dots everyone, Boba Excute on Chirrut, focus dmg on taunts and clearing taunts when possible to take out Rex. Generally one of the tanks is taken out by DN Annihilate. Opposing DN is taken down last. If you have Zader, that's your best bet. You can use all those enemy buffs/cleanses to your advantage. Zader + Boba allows for MASSIVE damage with Execute and Culling Blade, enough to one-shot chirrut (or anybody else, but chirrut should be your first kill if you can). Once chirrut goes down, you should be able to handle the rest. Of course, the key is keeping Zader and Boba alive long enough for them to use those specials multiple times each. Try using three taunting tanks, staggering their taunts so when Baze/Nihilus dispel you have another one coming. Ideally, when DN comes around to Annihilate, you have a taut up. Sun Fac, ShT, and STH would be good choices IMO. You lose that match though if DN doesn't reduce CD on Rex. I've started using Nihilus lead versus those teams. They don't do enough damage to kill one of your toons through the insane healing and DN can be used to assassinate opposing Bazes or DNs. Actually, no. By raising Rex CD; it only gave the opposing team tenacity up for 1 round longer. And as you saw, it was still no problem. I won by using mostly basic attacks. It's actually a good strategy and I have been 100% on offense with against this team. Now if I used sids special at the start than that would of been automatic game over, I lose. @vynn did any of this help at all? This is actually a strategy a guild mate showed me. It works wonders! I don't have Dooku and SO ready yet. Vader is actually clutch against GK+Rex. His Basic can ability block GK through foresight and through tenacity up. 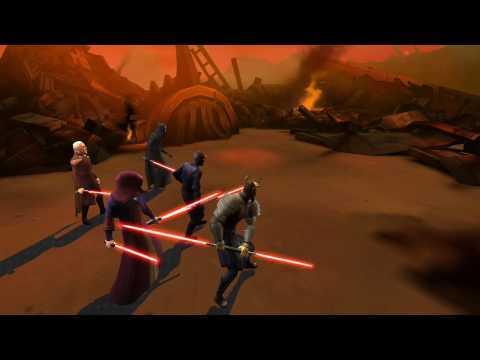 Only way I've beaten that team is with Maul, EP, Vader, Nihilus and STH. It's not 100% effective though, but it's the only way I've done it. What happens if I dont have DN? I usually use Zaul, EP, Vader, Sidous and GK but when facing a team with Rex lead, DN, Chaze, GK or Zariss, I usually use Zaul, EP, Vader, Boba and GK or B2. Problem is if I want to rely on Boba executing Chirrut, I would have to use my AOE debuffs to have maximum damage. If I dont use any AOE, Boba would not be effective. How would you approach this? Note: I am asking because with my current strategy I think i have no more than 30% success rate as the AI always seems to target my Boba first. Replaced EP with B2 and it went slightly better but still couldn't kill even ONE enemy.